People gather in the plaza at Siriraj Hospital to send Happy Birthday wishes to His Majesty, Bhumibol Adulyadej, the King of Thailand, on the King's 87th birthday. Friday was the King's Birthday, one of the most important public holidays in Thailand. 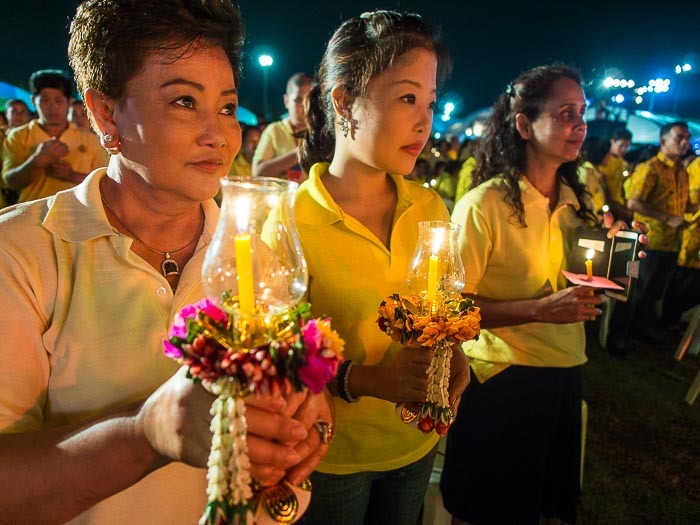 Last year's birthday celebrations were flavored by the political protests that gripped Thailand. The protestors, who were ultra monarchists, had their protest headquarters just a few blocks from the government's main celebration stage. 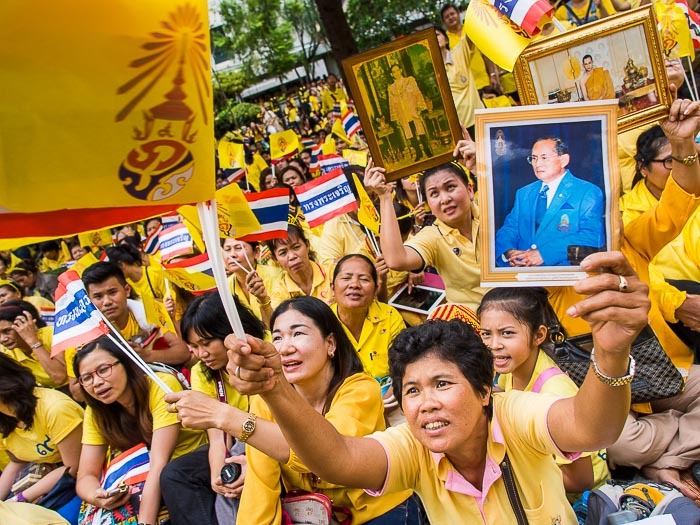 They hosted their own celebration of the King's Birthday at Democracy Monument, while the government hosted a celebration at Sanam Luang. People could move freely from stage to stage and both sites drew large crowds but it was all kind of surreal. 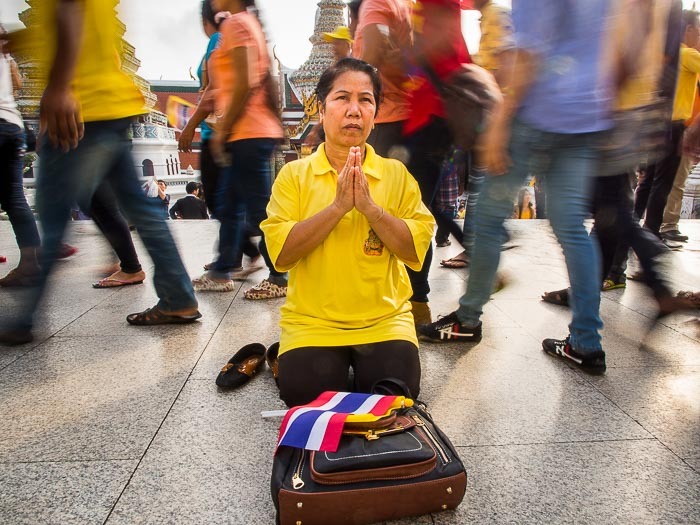 People walk past a woman praying for the King's health at a pagoda in the Grand Palace complex. The military government has prohibited any form of political protest and Bangkok is now more peaceful than it's been in at least a year. The government went all out this year to celebrate the King's Birthday. 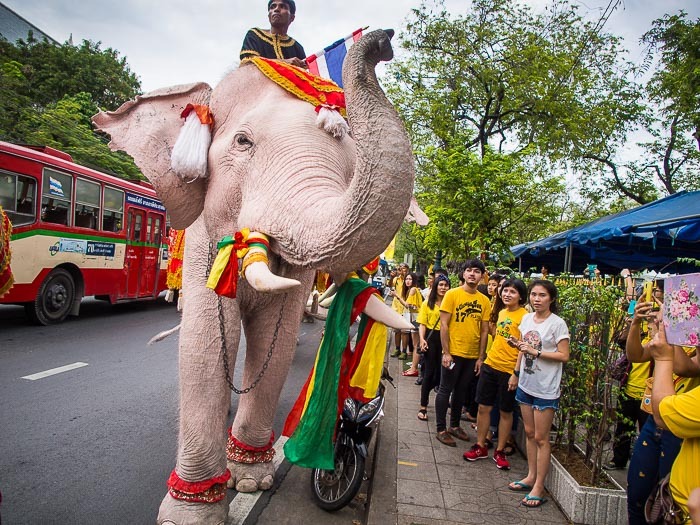 Elephants from the royal elephant herd walk through Bangkok on their way to Sanam Luang. Sanam Luang was turned into a huge fairground with multiple stages for cultural performances. Food booths lined the sidewalks around Sanam Luang. Every government ministry was doing public outreach in large tents with multimedia about His Majesty. The day started with a mass merit making on Sanam Luang. 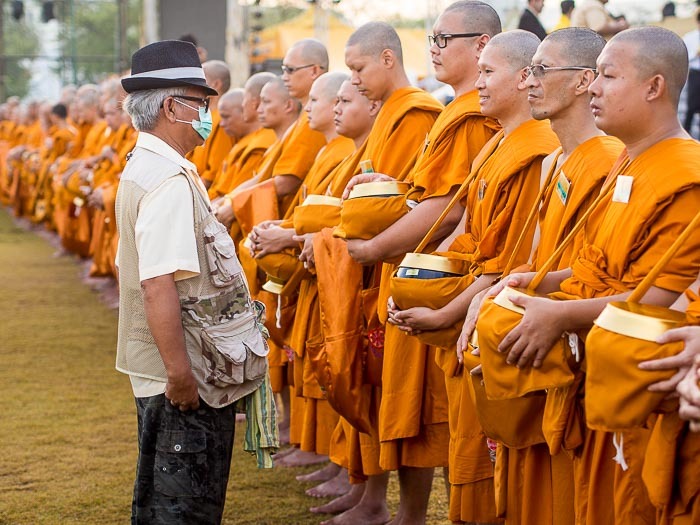 A man talks to a line of monks before the merit making started. The Palace announced early in the week that His Majesty would hold a public audience at the Grand Palace. Thousands of people came to the Palace early Friday hoping to see their beloved Monarch. Early Friday morning, just as the palace opened, it was announced that on doctors' orders the King would not be able to leave the hospital. I left the palace and went across the river to Siriraj Hospital. If the palace was crowded, the hospital was jammed. The plaza in the center of the hospital was packed. People were chanting "Long Live the King!" and serenading His Majesty (top photo). 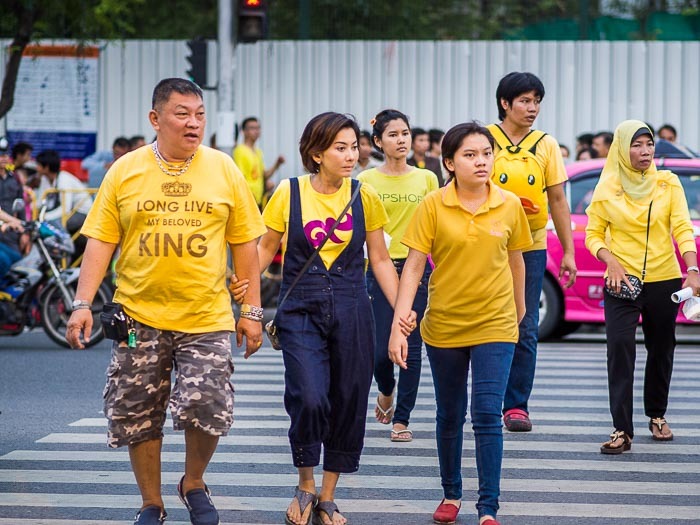 People walk into Sanam Luang for the King's Birthday. 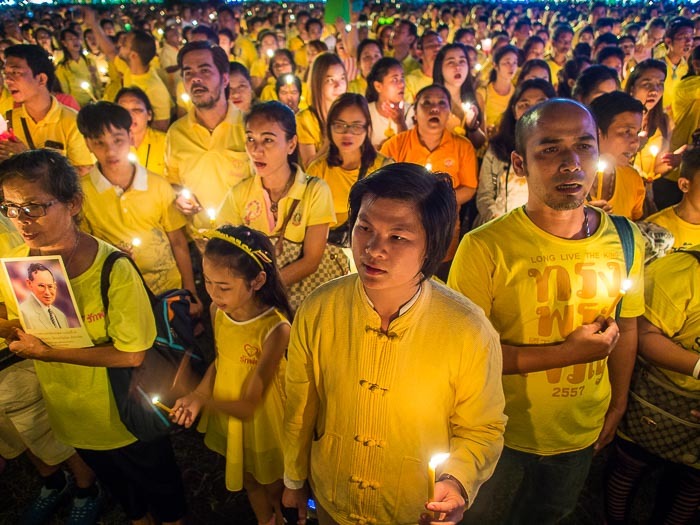 I went back to Sanam Luang in the evening for the candle light service that honors the King. The crowds were massive and continued to grow through the evening. By the time the candle light service started, about 7.30PM, it was so crowded we couldn't move through the crowd. We picked where we would photograph and then stayed there. In years of covering the King's Birthday, this was without a doubt, the biggest crowd and celebration I've ever seen. 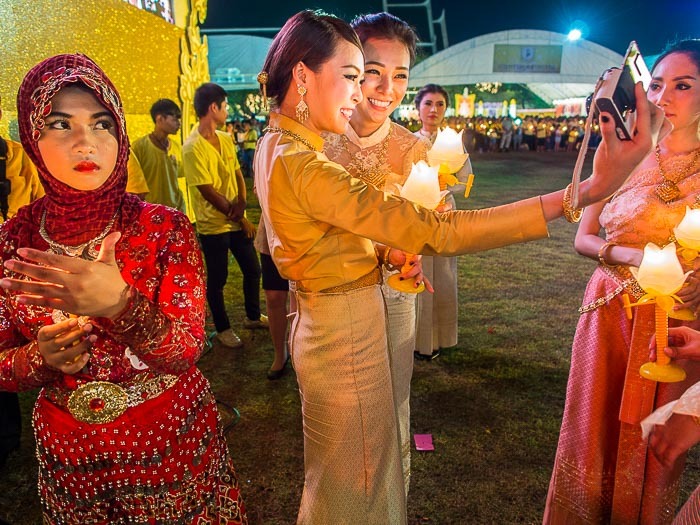 Women in traditional outfits take "selfies" just before the candle light service started. The ceremony ended with a fireworks display after thousands of Thais held their candles aloft to honor their King. 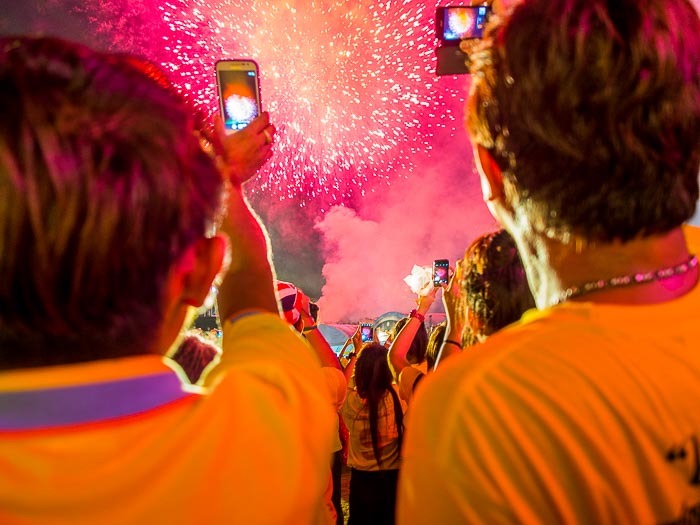 People use their smart phones to record the fireworks display that closed the ceremony. There are more photos of this year's celebration of the King's Birthday in my archive or available from ZUMA Press.